Graystone Manor, built in Salt Lake City, Utah in 1960, is believed to have been the first condominium in the continental United States. In those years, Directors and Officers (D&O) policies available to community associations were basic “non­profit D&O” forms, adapted from policies formerly covering Boards of museums, theater guilds, and symphonies. These early versions of D&O policies were affordable, but coverage was bare bones and limited the definition of “insured” to cover only “duly elected” Directors and Officers. Given the carrier’s strict adherence to this policy language, there was much room for improvement in this line of coverage. In the years following the establishment of Graystone Manor, the number of community associations grew and with it, a need for assistance with the financial and physical aspects of an Association’s day­to­day operations. Enter the formation of Management Companies, a worthy and necessary evolution/adaptation in the industry. Unfortunately, managers working at the direction of the Board were increasingly finding themselves named in lawsuits when unhappy owners sued over a Board’s particular action, or failure to act. This “vicarious liability” as it was called, created too much exposure for the community manager and in time, management companies were unwilling or, financially unable, to accept the risk and sought for ways to protect themselves. One method involved retooling contract agreements between the Association and the manager, wherein the management company employed complex indemnity provisions which required the Association to indemnify and hold the manager harmless (except in a circumstance involving “willful misconduct” or “gross negligence”). For Associations, providing both defense and indemnity for the manager proved difficult. How could the Association budget for potentially large, unexpected costs? Since managers were not working autonomously (managers by definition, only carry out tasks delegated by the Board), it only made sense that pressure be placed on the D&O Liability carriers to consider broadening the definition of “insured” on the policy to include the community manager and/or management company. And the carriers responded. Better D&O policies were devised, featuring extensions of the Association’s D&O coverage to the community manager/management companies in their employ. Early D&O policies, much like, believe it or not, some current day narrow D&O endorsements to package policies, only provide coverage for an “act, error or omission” for which the aggrieved party is seeking money damages. Unfortunately, modern-day community associations will find themselves in a number of circumstances where non­money damages are sought (e.g., a unit owner suing over the Board’s failure to enforce provisions in the CC&Rs, challenges to an Architectural Review Committee decision, or challenges to an election). The attorney fees alone to defend the Board and/or committee members against such challenges could easily be tens of thousands of dollars. Directors and Officers Liability policies offer two distinct protections: (1) defense costs including fees and expenses the carrier incurs in defending a claim; and (2) indemnity payments should the claim have merit. Surprisingly, some old school D&O policies contain a “within the limits” provision which means the defense costs incurred by the carrier actually erodes the limit, leaving only the balance to pay any resulting settlement. For example, if the Board purchased a $1 million D&O policy and the carrier spent $600,000 defending the Board only $400,000 would be left to settle any resulting judgment. The broadest D&O policies contain defense costs “outside the limits” provision so defense costs do not erode the loss limit, leaving the “full” policy limits intact for any resulting indemnity payment. Inexpensive D&O options provided by endorsement to the Association’s package property & liability policy should be a potential red flag for any conscientious board member or manager. These options are very affordable but provide only skeleton coverage, like in the early days of Graystone Manor. 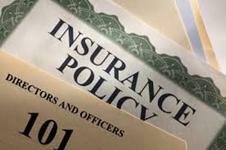 While D&O policies vary widely from carrier to carrier, spending $250 in premium to purchase a D&O policy from a well­known direct writer can result in omitting as many as four essential coverage components including no coverage for non­monetary claims and no extension of coverage to the community manager. Unfortunately, the Board of Directors won’t discover the policy’s shortcomings until the time of loss. Before moving to a carrier offering a broader form, some considerations ­ if the Board has knowledge of any act, error, omission, fact or situation that might give rise to a claim, it must be reported to the current D&O carrier BEFORE that policy expires. This includes knowledge of even the “potential” of a claim. Not doing so risks having the former D&O carrier decline coverage as a result of late notice (assuming it was reported after the policy, or any extended reporting period, expired). Any new carrier would also decline coverage since they would have required the applicant (Association) to warrant that they have no knowledge of an act, error, omission, fact or situation that might give rise to a claim. Prior knowledge of a potential claim puts the Association in a virtual “no man’s land.” The moral of this story: fully disclose knowledge of any claim or potential claim to the old carrier PRIOR to changing. Just as the CID industry has evolved over the last five decades, so have D&O policies, providing the Board with unprecedented opportunities to obtain a policy that broadens both who is covered and what is covered. In our litigious days of late, plaintiff’s attorneys are increasingly creative in finding ways to trigger coverage under these D&O policies. Any Board’s goal should be to engage a knowledgeable agent/broker and become as informed as possible about the D&O policy’s features. By purchasing a “following form” commercial umbrella policy, the Association may be able to supplement the policy to achieve sufficient limits to provide peace of mind. The concept of community associations was born in the era of peace and love. A good way to maintain the peace and love within an association might be to ensure well­intentioned board members, committee members, volunteers, managers and the Association itself are protected with the best D&O policy available.